A new update went live and I had absolutely no idea that it would be bringing such an amazing set of new cosmetics. When I discovered that the inventory of the Adventurer’s Quartermaster had been resupplied with not one but two sets of Elvish cosmetics I couldn’t contain myself and just had to get them all. Unfortunately I didn’t have enough Figments of Splendour to get both sets, so I got the one that I think is the prettiest, the Brilliant Forest Defender’s set. In fact this is probably the most beautiful Elvish cosmetic set that I have ever seen in this game! The other set of the Golden Forest Defender is darker, an likely more suited for a more gloomy environment. This set has amazing shimmery pastel rainbow colours. They make the outfit look magical. The default colour is dark, which is also pretty, but I wanted a lighter version and dyed everything in Belegaer Blue. There is also a Hooded version available for the mask, and a matching cloak, but I settled on a quiver for my hunter. It may be that these cosmetics are also available from lootboxes. In case you can’t bare to disenchant some Ered Luin cosmetics to get more Figments of Splendour, you may try to get them from there. Either way I am thrilled with my new outfit, and even put it on my Loremaster who is not even an elf! Hope you get a chance for some Figments! Disenchanting Ered Mithrin cosmetics is the way to go for me now, getting rid of some that I’ll never use anyway. I was able to get most of the Brilliant Forest set from lootboxes, thankfully. I can’t wait to use this set, or at least pieces from it, in an outfit of my own. It’s so colorful! 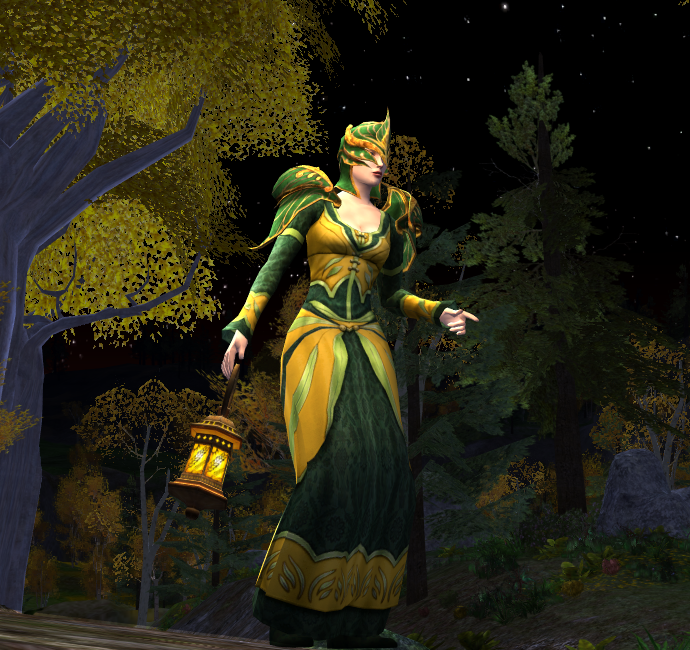 It truly breathes some fresh air into the pre-Isengard elven styles of LOTRO! Oh I love your pink test drive. In fact, I think most colours look great. Its a truly nice design! The mask! And it doesn’t mess with your hair style!